As Trump's Odds Of Victory Rise, Financial Markets Get Nervous Wall Street doesn't exactly love Hillary Clinton, but it knows what to expect from her. That's not true of Trump. This election will be "a very big deal economically," Dartmouth's Eric Zitzewitz says. 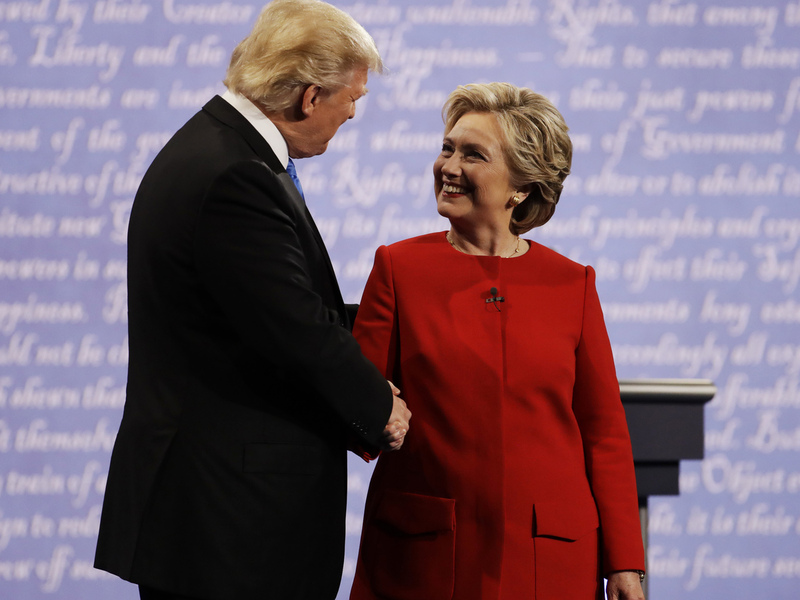 When Hillary Clinton appeared to be winning the Sept. 26 debate with Donald Trump at Hofstra University, stock futures rose and so did oil prices, a report says. When news broke Friday that the FBI had discovered emails that might be pertinent to its investigation of Democratic presidential candidate Hillary Clinton, stock prices suddenly took a tumble. The decline can be explained by an unusual development in this year's long, contentious presidential campaign, says Eric Zitzewitz, a professor of economics at Dartmouth College. For the first time in history, the financial markets seem to prefer the Democratic candidate for president over the Republican, and anything that lessens her chances of victory is likely to hurt asset prices, according to a paper written by Zitzewitz and Justin Wolfers, a professor of economics and public policy at the University of Michigan. "This election is going to be a very big deal economically. That's what we're finding," Zitzewitz said in an interview with NPR. The paper says a victory by Trump would have a much bigger impact on stock, energy and currency prices than previous elections. The Standard & Poor's 500 index, as well as British and Asian stock markets, would see a decline of 10 to 15 percent under Trump, the paper says. Oil prices would fall by $4 a barrel and the Mexican peso would lose 25 percent of its value, it says. "The market really cares. We have a 12 percent difference in the value of the S&P under the two candidates. When we did this work on past elections we were getting results more like 2 percent. This election is very different in that regard. The economic stakes are quite high," Zitzewitz told NPR. As many market analysts have noted, Trump's tax policies and their impact on the deficit and his criticism of the Federal Reserve, as well as his attacks on trade, would make him an unknown commodity in the economy. "I think that the market has sold off here because Donald Trump's prospects are improving," Bob Doll of Nuveen Asset Management said in an interview on CNBC this week. "The market isn't saying, 'I like Hillary and I don't like Donald.' It's saying, 'I like certainty and I don't like uncertainty,' " Doll said. Although Clinton is no favorite of Wall Street's, the markets at least have a sense of where she stands, Doll added. In their paper, Wolfers and Zitzewitz sought to quantify the market reaction to a Trump victory by looking at what happened during the first Clinton-Trump debate on Sept. 26 and correlating the results with data from the British betting exchange Betfair. As the evening wore on, Clinton appeared to be winning, and Betfair said her odds of winning rose. At the same time, stock futures and prices rose in the U.S., the United Kingdom and Asia and crude oil prices were also up, the paper says. Meanwhile the currencies of major U.S. trading partners such as Canada, Mexico and South Korea rose. Nothing else was happening that evening that would explain the market reaction, the paper says. The markets also rose over the weekend of Oct. 7-9, after the release of the Access Hollywood video in which Trump bragged about touching women without their consent. The reverse happened last week after FBI Director James Comey sent a letter to Congress saying his agency had discovered new emails that might be related to Clinton. As CNBC noted, "Bond yields have moved lower, and so have stocks, as the markets have begun to react to the possibility of a Trump victory in the last several days." A previous version of this story incorrectly said that markets had fallen after the Access Hollywood video leaked. In fact, the markets rose.